On the bright side, I was able to fit in a little reading! 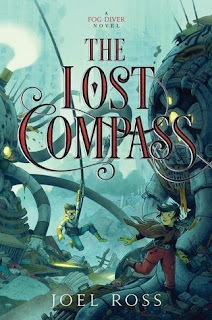 I started an eARC of The Lost Compass by Joel Ross. It's the sequel to The Fog Diver, a middle grade adventure from last year that I really liked. Here's hoping this one lives up to its predecessor! I also did my first Street Law class this week! It's a pro bono program where you get matched with a school or center (based on availability) and give a weekly lesson to kids or adults about the law. It's completely new to me, but I think it's going to be a great learning experience--definitely for me and hopefully for them, too. In other news, make-up and I are not getting along. I've never been a big make-up person. Aside from a few isolated events in middle school, zip. But I figure, law school, professional look, networking events...so I picked up some mascara, lip gloss and blush. Didn't even think about it before I put it on, but I had a bad reaction to the blush. Turns out my face is pretty sensitive, even more so now on this one spot. So it looks like I'm going to be a mascara and and lipgloss only (or lipgloss only) girl. :P At least until I'm feeling brave enough to try Almay or some other hypoallergenic stuff. I almost totally forgot to add this in, but super good news: I was offered a part-time internship and I'm officially all set for this summer! I'll be working part-time at my regular office and getting experience in a totally different legal environment the rest of the week. I can't tell you what a relief it is to have this all sorted out. I was like, THANK YOU, GOD! So, I'm off to finish the draft of my brief, complete a midterm self-assessment, do Monday's homework, outline for three courses, and plan out my next Street Law lesson! I hope everyone is having a great week and enjoying the weather. Looking forward to checking in with y'all again sooner rather than later! OMG! CONGRATS ON THE INTERNSHIP! I am so excited for you! I'm lowkey freaking out because none of the companies I've applied to have contacted me. D: But I'm crossing my fingers and holding out on hope. Thank you, Alyssa! I wouldn't freak out too too badly just yet. I know of at least one instance where the HR department didn't get around to filling their engineering intern spot until way later than usual. :P Still, lots of crossed fingers, lots of prayer, and maybe sending out a few more apps just in case? I'm impressed by the people who do fancy make-up, but I use it so rarely and I'm so pale...I feel like a clown whenever I wear it. I hope you hear back on an internship really really soon! Good luck with surviving the rest of the semester! On the make-up note, I do not react well to make-up either, so I actually cannot use anything you can buy at Target. I go with Bare Minerals and Tarte. It is natural, and although more expensive, because it is higher quality, it lasts longer! I actually bit the bullet and stopped by Ulta briefly. I tried on a bit of Bare Minerals with no ill effects, but it was a little more coverage than I needed (and a little pricy >.>). I wound up grabbing a small Clinique blush since they're hypoallergenic and allergy tested, but I'd definitely go back for the Bare Minerals if make-up becomes a bigger part of my routine. Here's hoping there are no more mishaps! Good heavens, reading about how busy you are makes me tired! ;) I'm glad things are working out so well, though! Very exciting! In a few months, I'll be announcing some life-changing news of my own on my blog (but not yet; I haven't even broken it to my parents yet). I've wanted to read THE FOG DIVER for a while now. I think I'll wait for the sequel to come out so I can read them together! I'm still working on The Lost Compass (school has killed free time), but I definitely recommend The Fog Diver! Can't wait to hear your news! I'm not much of a make-up person myself, it just takes so much time, usually, but sometimes I do like to change things up a bit. Maybe if you tried some foundation beneath the blush? Oh, I don't know, I'm no expert. But don't give up on it if you really want to try it, there are loads of natural brands out there that make make-up for sensitive skin. It's interesting to read about the pro-bono stuff - I know the American legal system is completely different from ours. I know our law students also do some similar activities, it would be interesting to see how they compare. Thanks so much, Kaja! I have high hopes for lots of learning this summer! Honestly, I'd love to do away with makeup entirely...but it's semi-expected in certain professional environments. Bad peer pressure. :( I think I have a good set of stuff that will work now for the (very) few occasions I use it. Fingers crossed there are no more issues.